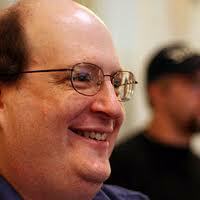 Jared M. Spool is the founder of User Interface Engineering, the largest usability research organization of its kind in the world. If you’ve ever seen Jared speak about usability, you know that he’s probably the most effective and knowledgeable communicator on the subject today. He’s been working in the field of usability and design since 1978, before the term "usability" was ever associated with computers. Jared spends his time working with the research teams at the company, helps clients understand how to solve their design problems, explains to reporters and industry analysts what the current state of design is all about, and is a top-rated speaker at more than 20 conferences every year. He is also the conference chair and keynote speaker at the annual UI Conference and Web App Masters Tour, and manages to squeeze in a fair amount of writing time. He is author of the book, Web Usability: A Designer’s Guide and co-author of Web Anatomy: Interaction Design Frameworks that Work. 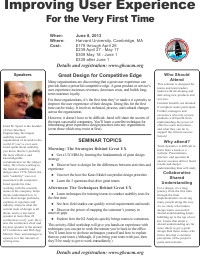 This seminar is designed for teams and team leaders tasked with developing and delivering new products and services. Greatest benefits are attained if complete teams participate. Further, managers and executives who rely on new products will benefit from understanding the power of effective team innovation - and what they can do to support the critical success factors! Team dynamics is difficult to learn from a book or a website. Presentations, practice, and question & answer sessions deliver faster results and deeper understanding than self study. For a design, it's a long journey from the first idea through the final implementation, involving many people along the way. Ensuring each person shares the same understanding about how that design should turn out is one of the biggest challenges we face. Seeing our designs rendered exactly as we imagined them is exciting. Yet it's frustrating when our designs aren't implemented the way we were thinking. As we study what makes design teams successful, shared understanding keeps bubbling up to the top of our list. Teams that attain a shared understanding are far more likely to get a great design than those teams who fail to develop a common perception of the project's goals and outcome. Students graduate from college with a substantial base of theoretical knowledge, but a limited base of the practical knowledge needed by industry. In fact, some things that are norms in industry may actually be forbidden in school – things such as team programming or copying and modifying existing code from books or the internet. Further, schools typically do not cover key issues such as dealing with legacy code, automated build systems, or practical testing. In addition to technical challenges, new graduates typically don't have a good appreciation for project scheduling, product lifecycles, teamwork, dealing with other organizations (such as QA), or requirements definition. To address this, at GBC/ACM we are implementing a program focused on the needs of the Journeyman Programmer. Many organizations are discovering that a great user experience can provide them a powerful competitive edge. A great product or service’s user experience increases revenues, decreases costs, and builds long-term customer loyalty. For these organizations, it’s the first time they’ve made a it a priority to improve the user experience of their designs. Doing this for the first time can be tricky. It involves technical, process, and cultural changes across the organization. However, it doesn’t have to be difficult. Jared will share the secrets of the most successful companies. You’ll learn a surefire technique for introducing great experience design practices into any organization (even those which may resist at first).